On a recent trip to New York City, I was disappointed to find that all the tours of the Steinway Piano Factory in Queens were booked solid until October. For pianists like me, visiting the Steinway factory is an absolute must. But since I couldn't manage it this time around, I decided to make an appointment at the Steinway showroom about 30 minutes from my home. If I couldn't see them being made, at least I would have a good time playing for a little while. After two hours of trying nearly every piano in the showroom, I decided which I liked best. The Steinway M series: a 5-foot, 7-inch grand piano in a high-gloss black case. It cost $63,800 (USD). All things considered, it's not a completely unreasonable amount to invest. Divided into Steinway's ten-year financing plan, it costs about as much as renting a studio apartment in a major American city. 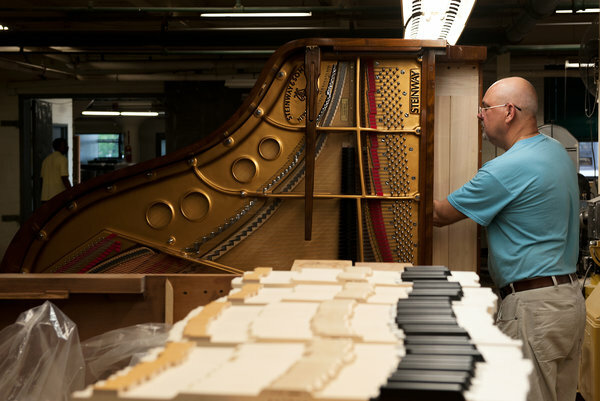 Steinways appreciate in value over time, and M-series instruments built 100 years ago are nearly 50 times more valuable today than at the time of completion. For music teachers and performers, the instrument will be their only major work-related expense aside from transportation. Personally, I spend more time with my piano than with almost anything or anyone else. (Last week, a busy week for me, I spent about nine hours driving my car, but about 20 hours playing my piano.) Buying a piano is like choosing a new office or home. We who spend most of our time and mental energy at the bench are obsessed with perfection, and we are willing to pay for it. While driving home from the showroom, I thought about what exactly $63,800 meant in my life. It meant I'd have to save for a little while before I could reasonably make the 10% down payment and begin the financing plan. It meant I would reduce my contributions to my savings and retirement funds, and I would have to eliminate superfluous purchases immediately. As I walked through my monthly budget, I finally arrived at my altruistic contributions. For the last six months, I've been giving ten percent of my monthly income to Peter Singer's recommended charities. How much would I have to earn to give away ten percent, and pay an extra month's rent in piano fees? I didn't want to crunch the numbers. It suddenly became very evident to me exactly what $63,800 means to me. It means comfort. It means "not a completely unreasonable" amount of money to spend on something that I don't need. To Population Services International, $63,800 means nearly 50 human lives saved from HIV infection through their condom distribution and promotion programs. For the World Health Organization, $63,800 is the prevention of more than 200 cases of malaria, diarrhea, measles, and respiratory infection (calculated by economist William Easterly). How many bed nets, vaccines, and life-changing surgeries could I provide with the money I'm funneling into a hypothetical savings account? Altruism puts us in our place. It gives us a small amount of perspective on a kind of living that we would otherwise never encounter: one in which the cost of improving lives is both incredibly low and miles out of reach. So it doesn't take $63,800 to make a difference. The World Bank sets the poverty line at $1.25 per day, and considering the fact that more than $531,000 in change was left at American airports' security checkpoints in 2012, I think we can spare a dollar here and there for the people who need it most. Projects like Live Below the Line show us just how much positive change we can make if we orient ourselves toward bettering the lives of others. Improving lives on a global scale does not require a large sum of money, only the knowledge of how far our money can go. While it's easy to know that an unnecessary purchase of many thousands of dollars can do good elsewhere, it's more difficult to remember that smaller, everyday luxuries like morning coffee and lunches out can do just as much to end extreme poverty. Join The Life You Can Save's team and Live Below the Line from April 28-May 2.